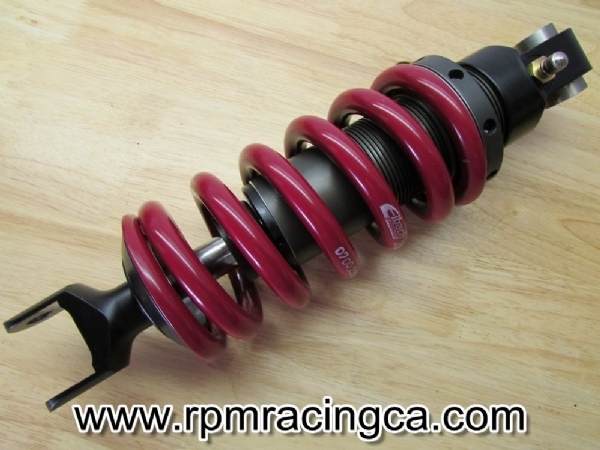 RPM has spent the last two years designing, testing & perfecting the only Yamaha FJ1100/1200 specific coil over shock on the market. This new shock features patented IVT technology that allows for dual valving within the shock for optimum ride and performance. Like the RPM fork valves were also designed for the FJ with the IVT technology, the rear shock is superior in technological advances over any other aftermarket shock on the market. All other aftermarket shocks are a universal shock that is a single stack valve or adjustable orifice system that must be shimmed lightly for so assimilation of ride quality. They then have to put a high rate spring on the shock to support the weight of the FJ. This combination offers substandard ride and performance capability. The RPM shock with the dual valve IVT technology allows for proper shim stack valving for the best performance ride quality available for what is termed "slow speed" shock travel. This slow speed travel is the shock moving slowing as it is absorbing the minor imperfections for the road surface through the shim stack. The IVT circuit is an active circuit that immediately takes over in the event the shock sees "high speed" movement. High speed movement is major changes in the road surface such as potholes, rail road tracks and other major imperfections of the surface. The IVT bypass technology and properly valve shim stack work in conjunction offer the ultimate in shock performance for your FJ. This dual valve system then allows the bike to be properly sprung by using lower rate springs. There are two different spring available for the RPM shock; single and dual rider. Single rider includes a combined weight of rider, gear, luggage or passenger up to 275 pounds. Dual rider is for any single rider, passenger, including gear, luggage from 276 pound or greater. If you ride more than 50% of your time without a rider you should select the single rider rate. The preload can adjusted to compensate for the second rider/additional weight if required. The other additional benefit of the RPM shock and the dual valving is the fact a remote reservoir is not needed for the shock to function properly so you do not have to find a place to mount a canister. The RPM shock is a complete package that includes everything you need and there is nothing else to buy. A wrench for adjustments of the preload settings. The other aftermarket shock manfacture have to offer you several varieties of the shock which each deliver a different performance level due to the universal application of the product and the adaption of such product compramises the function of the shocks performance. The shock carries a lifetime warranty against manufacture defects. Thank you Randy for creating the RPM shock the bike as it rides 100% better and feels more responsive in the corners. When I look down and I am going almost double the speed of what it was with the stock shock.